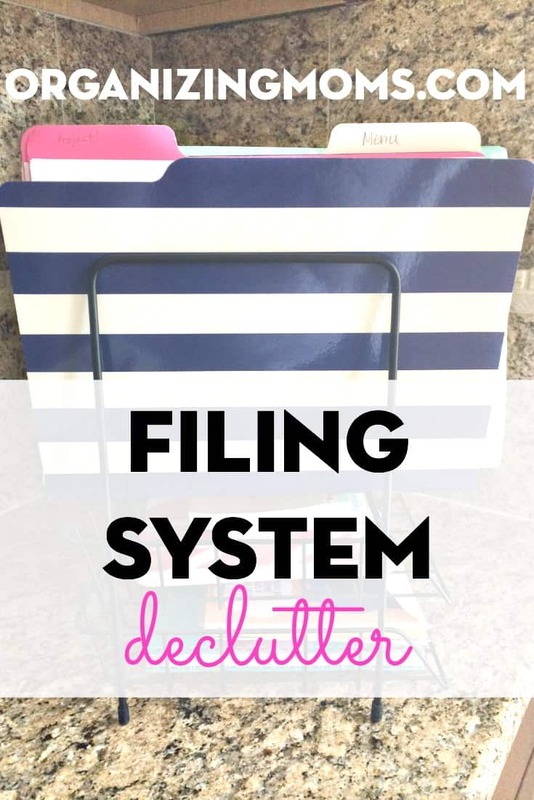 Do you have a good system set up for filing paper? I’ll be honest – my filing system is still a work in progress. I’ve tried a lot of different systems, but none of them seem to work out quite right for me. 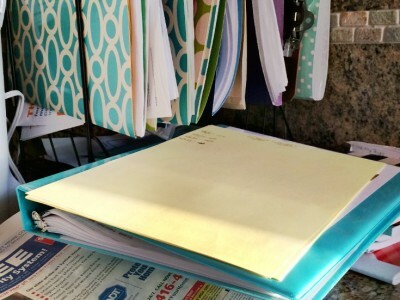 Today, I’m writing about how I decluttered my filing system. I’m sure not everything here will apply to you and your unique filing situation, but I hope that this post will help you anyway. I know it helps me when I read about how other people organize things. 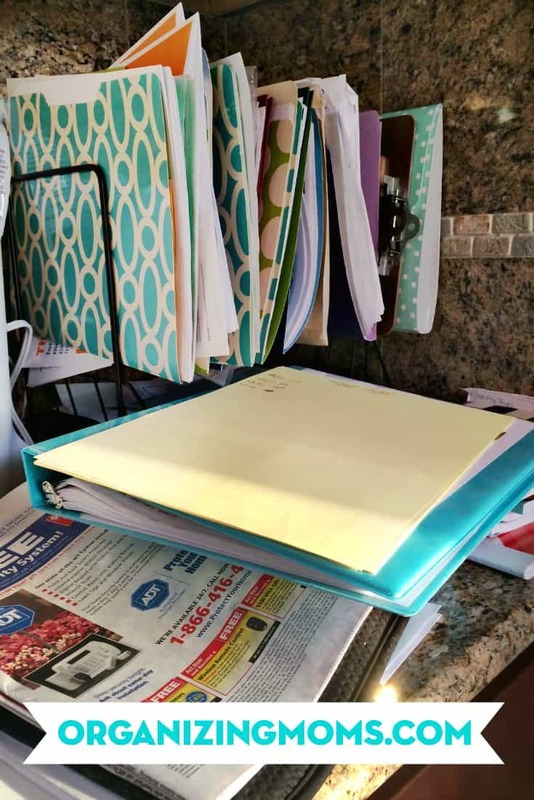 I have done a few things in the past few years that have helped me to keep papers more organized, but I’m constantly tweaking and changing my systems. Part of this is because we’ve moved, and the way our house is set up made it necessary to change up the system. 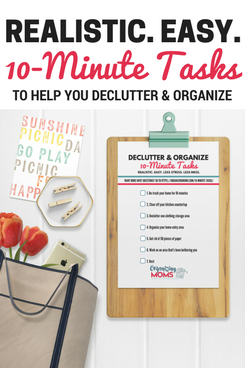 Part of it is that I’ve done a lot of decluttering, so I don’t have as much paper to organize. And, part of it is that circumstances change as families grow. Files I needed to keep when our sons were babies are very different than the file I need to keep now that they’re a little older. Even though I have a so-so system, I knew it was time to go through it and declutter the things we didn’t need any more. Before the Filing System Declutter. A desk organizer. 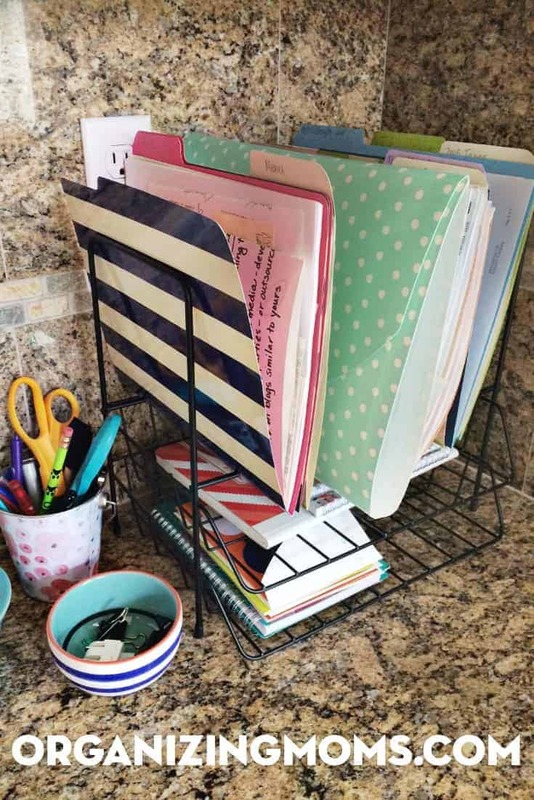 I love this organizer because I can see all of my folders at once. It’s easy to grab a folder while I’m working, or file something away quickly. I don’t have to thumb through a lot of papers and folders. Unless I don’t declutter it, and then it’s just a very visible mess. Slash pockets in a file box. After reading The Sunday Basket, I started doing a weekly review of all of our family’s papers, and I file pending things in slash pockets. I also use slash pockets to store travel documents. Maybe/Someday Folder – For things I might want to do someday when I have more time. These are things that look super cool. I don’t want to forget about them, so I put them in this folder. Periodically, I go through the folder, and usually wonder what in the world I was thinking when I decided to keep some of these things. Sometimes, I find some great ideas that I “forgot”about in this folder. Waiting Folder. This is for stuff that I need input from someone else in order to complete. I keep shipping records in there for things I’ve sold on Amazon. Sometimes I file receipts in this folder if I think I might need to return something. You can put anything in this folder that might need to come back to later. Blog Post Ideas Folder. I have a tendency to think of blog post ideas when I’m out and about. I jot them down on a piece of paper, and put them into this folder when I’m by my desk. Later, I can go through the ideas and schedule posts or pitch bad ideas. School Folder. For all things related to school. I was a room mother this year, so it was nice to have everyone’e email addresses close by. Menus Folder. Any restaurant that will deliver to our house (and that’s about four restaurants), get a place for their menus in this special folder. Medical Receipts Folder. A few years ago, this folder was huge. Thankfully, now it’s much thinner. Project Folders. 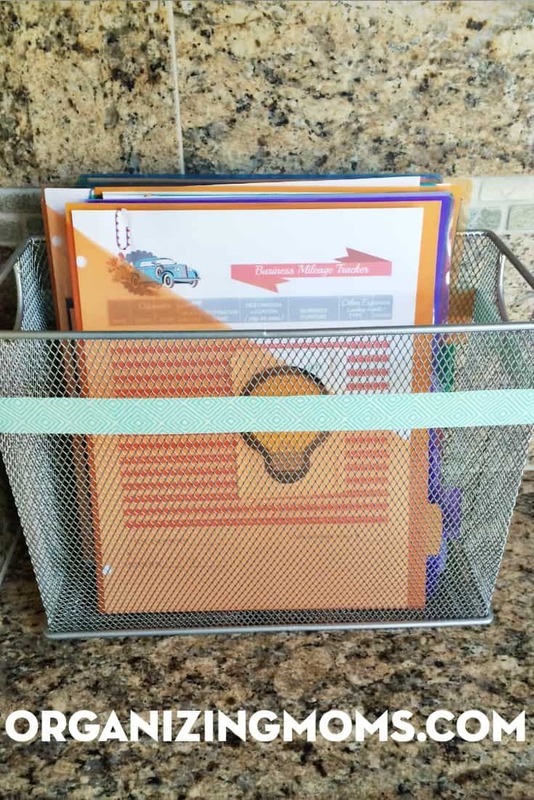 These are project-specific folders for things we’re working on for our house or family. For example, I’m trying to consolidate a lot of our finances into fewer accounts, so I have a special folder for this project. Accordian File for Business Receipts. I bought one at Target for $1. It fits nicely into the desk organizer, so there are no excuses for me not to save things properly. Tax Information Folder. This is where we keep all of the information we’ll need to include with our personal taxes. I like having this folder at my desk, but I’m considering moving it to our family’s mail file box so it’s easier for my husband to find too. Especially if my desk filing system gets totally out-of-control again, having this in a more central location would be good. Tax Information from Past Years. Yes, years. This stuff all got packed into accordion files, and put away into our old file cabinet. Hopefully I’ll never have to look at it again. Fingers crossed! Car Accident Paperwork. We were in a car accident that involved a lot of follow up doctors visits, shenanigans, and arguing with our insurance company. I have records of it all in one huge folder. This was also relegated to our old filing cabinet. Not seeing it all the time is sure to relieve some stress! Moving Files. We have records and paperwork from our past move. This was also relocated to the old file cabinet. Blogging Stuff. This was taking over my filing system. I made a binder to store it all, and got it out of the desk organizer area. Rewards Program Information. 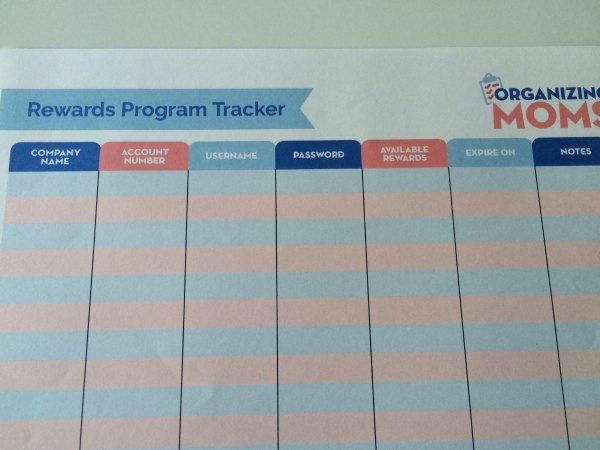 I transferred a lot of this information to my rewards program tracker. I put some of the documents in sheet protectors, and put it in our household binder. Folders for old projects. Some of these projects were done, some had been abandoned, and some just didn’t make sense any more. I got rid of a lot of paperwork by getting rid of this stuff. I hope this article was helpful to you!